On a sunny day on Choumert Road off Rye Lane in Peckham I came across these two gentlemen seated on chairs on a red carpet. The scene is very Peckham and surely adds to the jollity of life. 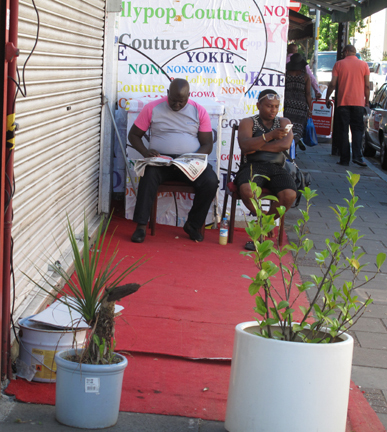 This entry was posted in Peckham, Photography, Rye Lane, street photo and tagged Choumert Road, red carpet. Bookmark the permalink.